Typically aloe vera is thought of as a healing plant, the liquid being used most often for burns or abrasions to the skin. However, these are not the only benefits to the aloe vera plant. The pulp from the aloe vera plant is used in juices and in recipes to provide the same type of healing inside the human body. Aloe vera is loaded with vitamins and includes many essential vitamins that humans need on a daily basis, except for vitamin D. Aloe vera is also anti-inflammatory, which is one of the reasons it is used so often in beauty care products. It is often used externally to aid in healing; however, the juice and pulp of the aloe vera plant can be ingested internally to provide even more health benefits. The aloe vera plant grows 12 months of the year, which increases its appeal for farmers and gardeners. Aloe vera juice aids in digestion and helps the circulatory system because it helps with cell growth and the dilation of capillaries. Since aloe vera is anti-inflammatory, it helps heal the digestive tract and cleanse the colon. For a person to receive the benefits of aloe vera juice, they need to consume about four ounces a day to detoxify the body. 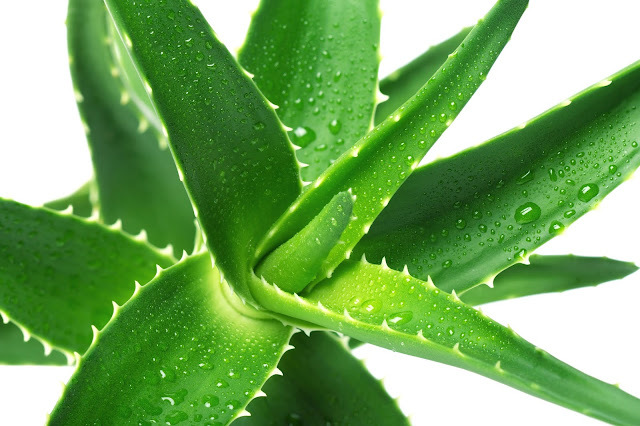 The British Journal of General Practice published the findings of ten studies involving the benefits of aloe. They discovered it was helpful in lowering glucose in diabetic patients and with such promising results more research is being conducted for clinical effectiveness. Aloe gel is used topically for sunburn or other minor burns, and is also found in other beauty products that add hydration to dry skin. It is even used in products to aid the itchiness of insect bites. Aloe is used often in the summer because of the increase in outdoor activity combined with the increase in sunshine and mosquitoes. Aloe vera gel is used to make juice once the yellow aloin is removed, which is very bitter. Aloe is also added to products such as yogurt, ice cream, cream cheese, spring water, tea and desserts, and is sold in health food stores such as Whole Foods, Wegmans , GNC and Trader Joes. "We already see tendencies of Aloe Vera becoming a mainstream product. We are already delivering product to some beverage companies that blend our Aloe Vera with a soft drink type of drink,” says Australian Aloe Marketing Limited CEO Mats Johnson.